F-4 is an agent with Air Intelligence. When we first meet this intrepid warrior, we are told he is a "Fifth Column Fighter". We are also informed that he is a "spy hunter". From both of those and the missions he gets sent on, he definitely is involved in counter-espionage as his job is to hunt and fight those seeking to steal or destroy from the country. We also learn right away that his area of expertise is aviation and whether it is flying a one-man pursuit plane or piloting a bomber or operating the machine-guns on any number of craft, he shows over and over that he knows a thing or three about being in the air. He also knows more than most about crashing to the ground because so many of those in the skies along with him do not want him there and can prove it. He is both an excellent crash-lander and a lucky son-of-a-gun because several of the collisions should have killed him several times over. The first few missions we have recorded make it difficult to be certain what his nationality is. He is operating in Europe and answering to British officers so it would not be illogical to think he was British. Halfway through the 15 missions we know of, however, it is clearly stated that F-4 is American and as the U.S. grew closer to joining the conflict with Germany and Axis agents start in earnest to stop American aid to the Allies, he leaves the European theater and heads home. There is virtually nothing we know about F-4 the man. We do not even learn his name is Rex Keene until near the end of the tales. We do not know where he is from or how he got his start as a secret agent. Conjecture is all we have. We surmise he is in his early 30s based on his appearance and his demeanor. He is in great shape with rapid reflexes shown in his flying skills. He is a good fighter with fists and guns. He has to have a very hard head because he gets bumped on it nearly every mission. And he is fond of hats. 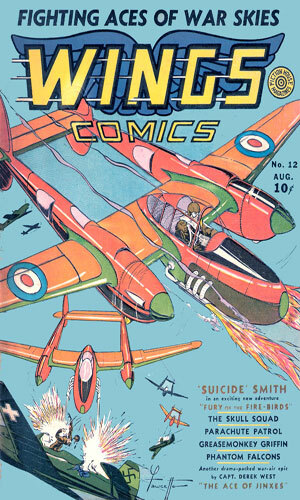 Fiction House was a pulp fiction publisher from the early 20s who decided that comic books were a profitable line to get into and it used its stable of experienced writers to come up with interesting stories. 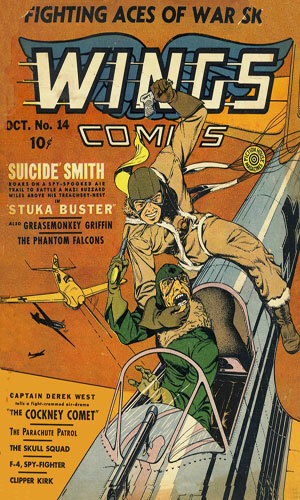 One of its earliest pulp lines dealt exclusively with aviation and when it moved into comics, it made sure it had a similar entrant in the graphic world. 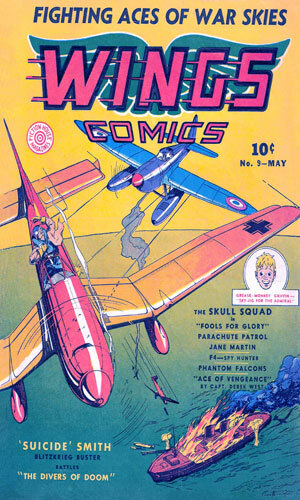 Wings Comics was its name. The actual creator of F-4 of the Air Intelligence is not known by me. I read in ComicBooksPlus that Charles Sultan likely was the original artist so it is to him I gave creator credit. If somebody knows differently, let me know. The person credited with writing/drawing each of the early issues was Alexander York, likely a house name. "York" made it seem that F-4 was a British agent though there was never any definite statement to that effect. Once the writing passed to "Bill Box" he was absolutely shown to be an American who worked for the Allies. The real name of F-4 was not revealed to be Rex Keene until adventure #13 and after another two missions he would be gone for good. A slight difference occurred between the tagline given the series on the covers and that in the opening panel of the actual comic. It was insignificant to the actual stories but mildly interesting to me. 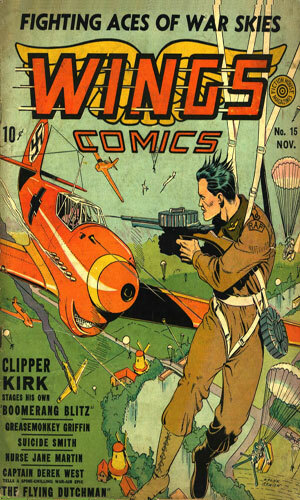 On the covers he was identified as "F-4 - Spy Hunter" (once "Spy Hunter of the Air Intelligence", once as "Spy Ace", and one as "Spy-Fighter"). On the panel he was a "Fifth Column Fighter" for issues 1-5 and 7 and no extra tag for 6 and 8-15. Again, there is little importance to this but I thought I would mention it. 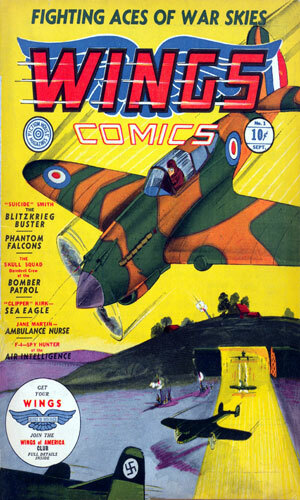 From Wings Comics #1 - F-4 is invited to watch the test flight of new British pursuit plane when it suddenly does a nose dive. Sabotage is suspected and F-4 takes the task of finding out who. 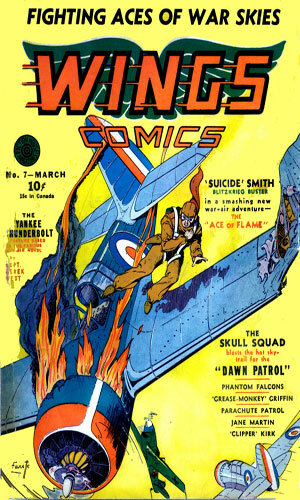 From Wings Comics #2 - This mission has F-4 in Canada helping the Canadian Air Intelligence people find out who is causing their new bombers to crash. 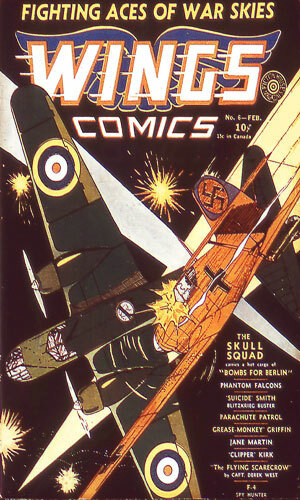 From Wings Comics #3 - Back in Britain, F-4, the spy-ace, is asked to find out who is the spy in the 110th Pursuit Squadron giving away vital intel to the German raiders. From Wings Comics #4 - To find why the British 10th Observation Squadron is particularly lucky to avoid trouble over a particular town on the mainland, F-4 takes the role of a green pilot joining the group. 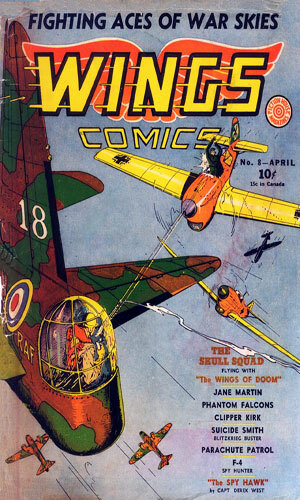 From Wings Comics #5 - The British Navy borrows F-4 for a mission to stop impostors inside the Service from blowing up the locks in the Suez Canal. 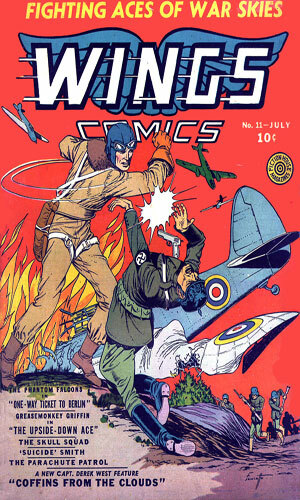 From Wings Comics #6 - F-4 takes the role of a British RAF pilot turning traitor to get his hands on a list of other British fascists. 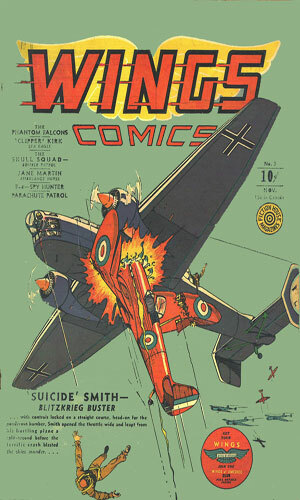 From Wings Comics #7 - A friend of F-4 in the RAF asks him to help find out if the man's brother, a fellow pilot, is really working for the Nazis. From Wings Comics #8 - Back in America, F-4 is sent to Hawaii where rumors are flying that the Japanese are planning an attack there soon. He is joined by an undercover agent, J-9. 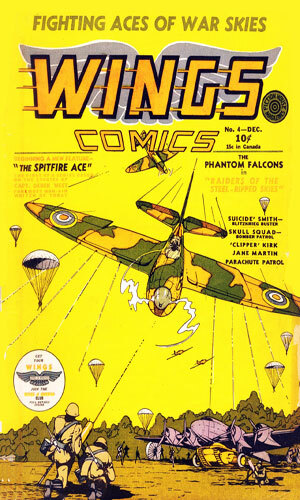 From Wings Comics #9 - F-4 is pulled to Africa to help the British Allies discover who in Ethiopia is aiding the natives attack supply convoys. 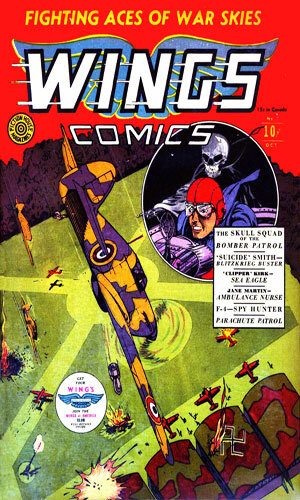 From Wings Comics #10 - F-4 is sent to Antigua to look into subversive activities taking place on that island. The reception he gets is less than friendly. 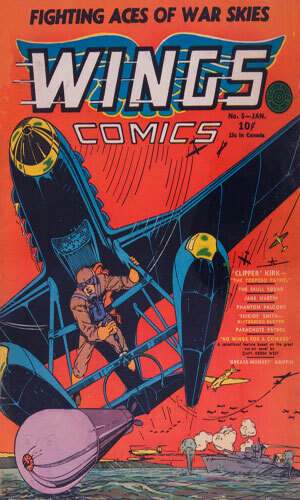 From Wings Comics #11 - It is to South America that F-4 is sent to work with another agent to locate where the Nazis are building a base of operations. From Wings Comics #12 - The job takes F-4 to Panama where some valuable blue-prints have gone missing and it is his job to recover them. From Wings Comics #13 - Back in America, F-4, finally identified as Rex Keene, is sent to Alaska to stop sabotage on a marine base. 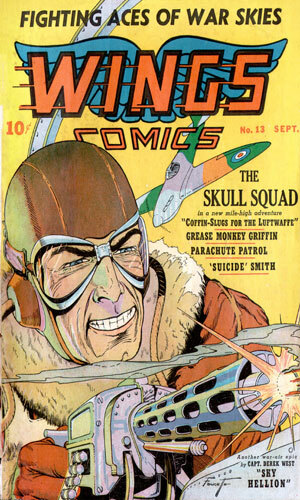 From Wings Comics #14 - In the Virginia mountains, F-4 gets wind of a Nazi plot to kill the President when he christens a new battleship. 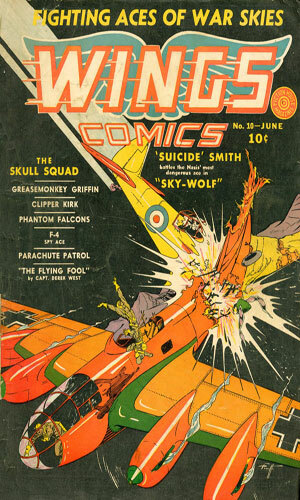 From Wings Comics #15 - F-4 is sent to the West Coast to find out who is destroying a new plane being tested and how they are blowing it out of the skies. Fifteen adventures and not one of these standard-fare missions grabbed me. I am surprised it lasted as long as it did. It had nothing going for it. Sub-par plots and no characterizations whatsoever. Dialogue was weak at best and inane at times. Artwork was ho-hum. You can tell I did not care for it. But it did have, as at least one other comic spy series did, a somber prediction a year before of Japanese preemptive attacks on the American fleet on Hawaii. In these modern days of conspiracy theories about how Roosevelt "knew" the attack was coming and allowed it to push the U.S. into war, it is interesting to see that even deadline-challenged graphic artists for a small publishing house worried about possibilities. Knowing it could happen and knowing when it would happen are always two different things, except after the fact when Monday-morning quarterbacks start jawing.